SearchResearch Challenge (11/30/16): Mercury where?? 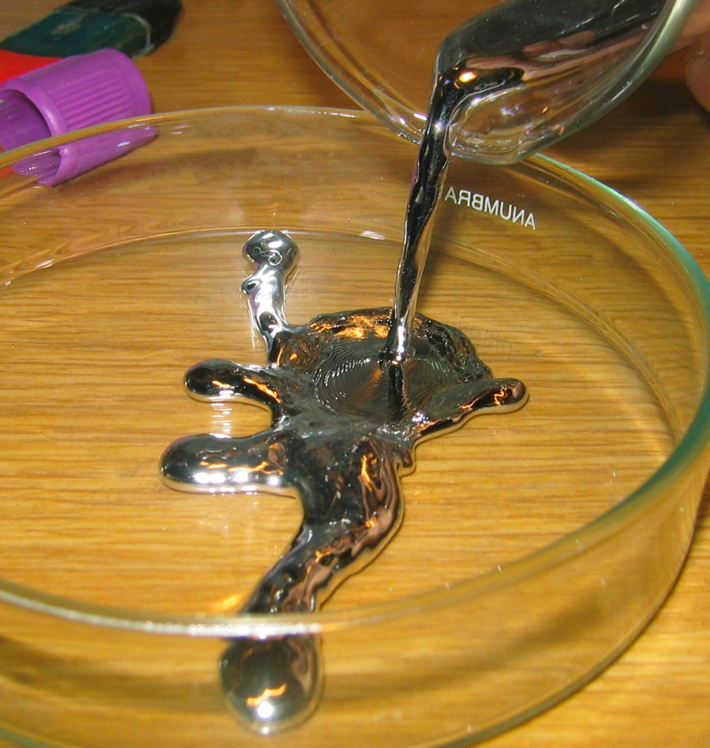 Mercury is pure metal magic. When I was a kid, we used to occasionally play with small beads of mercury when one of the kids would break a thermometer. Nobody told us it was toxic, so we'd roll small beads of it back and forth in our hands, amazed at how heavy it was and how... liquid it is. You shouldn't do this (but it was a lot of fun). Liquid mercury. P/C Wikipedia Commons. 1. Mercury is so magical that apparently at least one ancient Chinese emperor purportedly used enormous quantities of mercury in his preparations for the afterlife. Can you find which ancient Chinese leader used vast amounts of mercury in his funeral compound? Why did he do this? 2. At one time mercury was also thought to have nearly magical medical properties. Is it true that mercury was one of the most important drugs that was carried on the Lewis & Clark expedition of 1804 - 1806? Is it also true that you can track the path of the L&C expedition by finding the mercury-laden latrines of the Corps of Discovery as they trekked across North America? 3. Why is Silicon Valley's local newspaper called the "San José Mercury News"? What's mercury got to do with the news of the area? 4. Once upon a time I worked as a research scientist at the IBM Almaden Research Center in southern Silicon Valley. I recently learned that a nearby state park where I would go for long runs used to be a center for mercury production. What is the name of that state park? And should I be worried about my health after running (for several years) through an old mercury mine site? Be sure to let us know how you discovered your results. Answer: The Greek Islands: Birth and Graffiti? 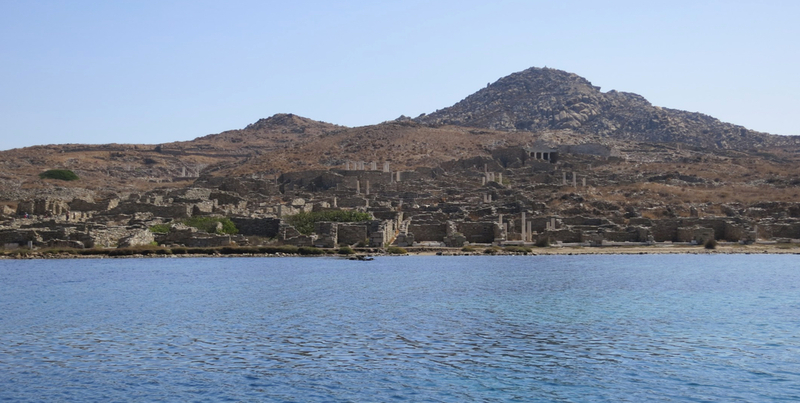 Our Challenge this week was to find out about the Greek island of Delos and the reported appearance of a new-ish island near Santorini. Delos: Right in the middle of the Aegean. I had a couple of Challenge questions about Greek isles. The first asked about something I spotted while wandering around on Delos. 1. 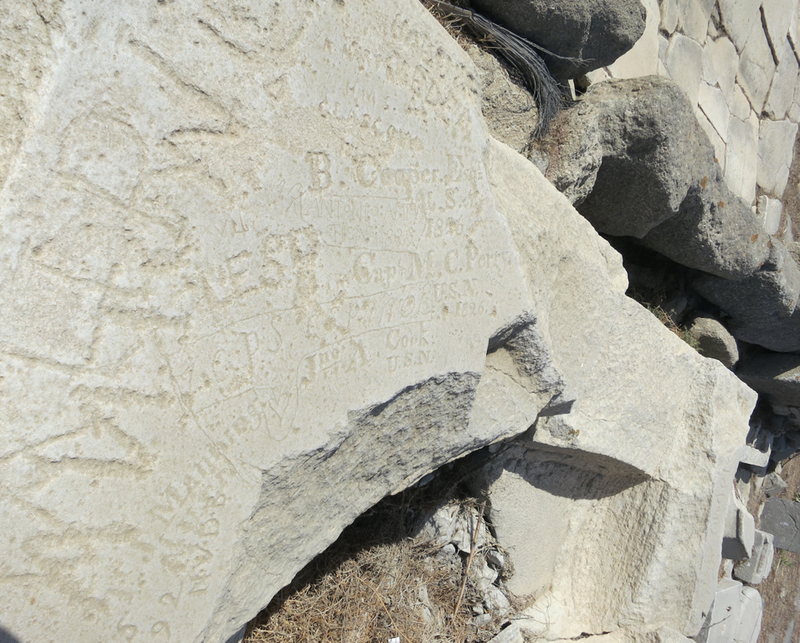 What's remarkable about this graffiti I found on Delos? Do you see what I see? Can you prove it? That last name rung a bell for me. If I remember correctly, wasn't he the Commodore that forced Japan to re-open itself to trade in the 1850s after more than 200 years of self-imposed isolation? Naturally, I did searches for these names (Cooper, Cook, Perry) each at a time, but only M. C. Perry got many hits. My memory served me well. M.C. Perry (Matthew Calbraith Perry, was an officer in the US Navy from 1772 - 1855). Now, the question becomes: Could this graffiti be from the same famous M. C. Perry who opened Japan in 1853? The Wikpedia article about Perry tells us that "..From 1826 to 1827 Perry acted as fleet captain for Commodore Rodgers. Perry returned to Charleston, South Carolina for shore duty in 1828." But that's a bit vague. It's not clear where he was in 1826-27. Where was the fleet in those years? Where was Matthew Perry? (If that hadn't worked, I would have started varying his name, trying variants like "M. C. Perry" or "Matthew * Perry" -- but I didn't need to, as this query worked just fine. Sep. 1824 - 5 Aug. 1827 - Served as Executive Officer, U.S.S. North Carolina, flagship of the Mediterranean Squadron under Commodore Rodgers, engaged in protesting American commerce from Greek pirates. In 1825-26 participated in a visit to the headquarters of the Greek Revolutionists and in an interview with the Captain Pasha of the Turkish Fleet. Promoted to Master Commandant, 21 Mar. 1826. "He subsequently [after 1824] served as Executive Officer of the USS North Carolina, flagship of the Mediterranean Squadron under Commodore Rodgers, which was engaged in protecting American commerce from Greek pirates. He was promoted to Commander on March 21, 1826, and spent most of the next four years stateside." This is confirmation of the dates, ship, his officer and his promotion to Commander. Now.. did they make it to Delos in 1826? To answer that question we need to find the log book of the USS North Carolina, or perhaps letters from men on board. 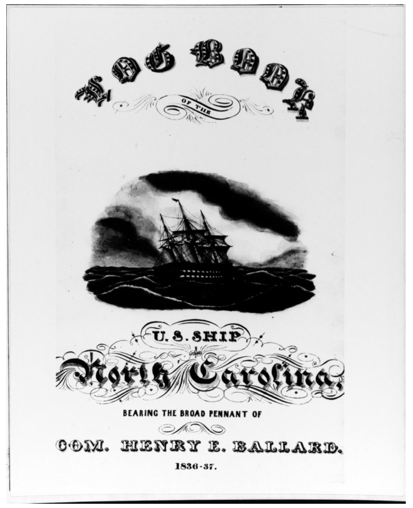 USS North Carolina Log Book 1836-37, from US Navy Military history site. which led me to the first result from Google Books which was the: "Guide to Non-federal Archives and Manuscripts in the United States Relating to Africa: Alabama-New Mexico." This is great! The logbook still exists somewhere, and this finding guide can tell us where the logbook is kept. Now, where is the finding guide? At this point, it looks completely plausible that the USS North Carolina visited Delos sometime before March 21, 1826 (remember: he was promoted to Commander on March 21.. he would have made his graffiti reflect his new status). I'll visit Stanford later this week and see if I can't track down the logbook itself. Stay tuned. I was rewarded with a hit! In the book The Navy's Godfather: John Rodgers, we find this quote at the beginning of Chapter 16. "By the middle of June, 1826, the squadron had reached Vourla near Smyrna, after a lesiurely thirty-four day sail, the length of the sea, from Gibraltar with stops at Algiers, Tunis, Carthage and the islands of Milos, Paros, and Delos. The commodore spent four days at each island, digging among the broken columns and tombs, exploring what were once magnificent Greek structures, and collecting enough relics to fill ten wagons, including two altars from the temples of Diana and Apollo on Delos." Not only do we know that the USS North Carolina (which had M. C. Perry onboard) visited Delos, but they specifically stopped at the temples of Diana and Apollo. (Recall that the graffiti was found on the base of the statue of Apollo... at his temple.) I'd say that M.C. Perry, the famous one, was not only there, but spent quite a bit of time etching his name into the pediment at the Temple of Apollo. and found the Naval Register for 1826, which includes entries for Cooper, Cook, and Perry. They were all on the same Mediterranean cruise under John Rodgers, and apparently "visited" the Temple of Apollo together as well. As Chris points out, they were: John A Cook, Lieutenant on the Porpoise; Thomas J Manning, midshipman on the Porpoise; Benjamin Cooper, a lieutenant on leave; and of course, M.C. Perry was (at the time) a Lieutenant on the North Carolina. 2. 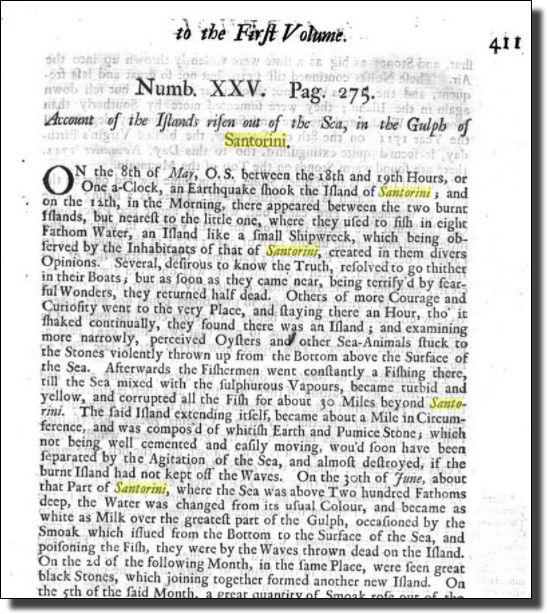 Can you find a written contemporaneous account of that early-18th century eruption on Santorini? Remember that "early 18th century" means sometime in the years 1700 - 1799, which is why I added the number ranger operator: I want web pages that talk about Santorini, "new island," sometime in those years. That query gives lots of good background, including the observation that a new island emerged around 1707. But the results don't seem to contain any first-hand accounts. "On the 18th of May 1707, two light earthquake tremors were felt on Santorini... at sunrise on the 23rd, a mass seemed to be floating on the water ... seen about 200 meters west of Micra Kameni at a spot where the sea had been only eight fathoms deep and fishermen had formerly cast their nets. It was at first taken for a ship wrecked on the reefs of Micra Kameni, but soon was recognized as a new bank that had just been formed of blacks rocks with white ground in the center. No audible sound or violent shaking had accompanied the appearance of the island. For several days it was possible to visit it without undue risk.... From the surface of the rocks they [the visitors] collected large numbers of oysters and urchins [from rocks that were uplifted from the sea floor]. But suddenly the visitors felt the ground shake and move beneath their feet as the reef began to tilt. The sea became agitated and turned yellowish around the shore; it gave off suffocating sulfurous odors, and dead fish floated to the surface of the water. The island grew before their eyes; in a few moments it rose in height about 7 meters and spread laterally to twice its former diameter..."
The book goes on to describe several months of hot water, floating rocks (pumice), discolored water, flames, the sound of a roaring furnace, and boiling water. At times incandescent rocks covered the surface of the island, making it glow in night and day. Explosions, fiery jets, the sounds of cannon and pipe organs. All in all, it sounds quite magnificent, if somewhat frightening. Near the end of the long and dramatic account of the eruption, Fouqué mentions another book that he used for his account--that of the Journal de Voyage of Aubry de La Mottraye. This search took me exactly to the place I was seeking--his book "A. de La Motraye's Travels Through Europe, Asia, and into parts of Africa," in English, scanned into Google Books. From Google Books: page 411 of the scan. The good news is that this account (in the book by Aubry d.L. M, but a marginal note says was written by Antonio Delenda di Gasparo) is VERY consistent with the account we found earlier (in fact, it's very clear that Fouqué drew heavily on Aubry's account, right down to the oysters on the rocks cast up by the eruption). I highly recommend this book for the sheer adventure of it. His accounts of traveling through Europe, Asia, and Africa are remarkable (and much of the Middle East--remember that he was walking or sailing for most of this tour). 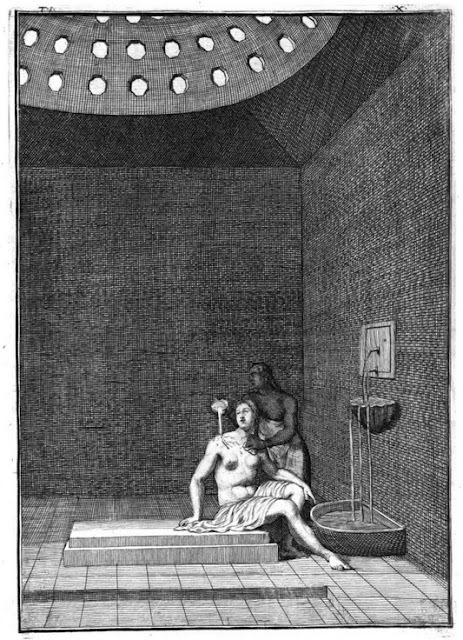 And the illustrations, such as of this Turkish hamam (Turkish bath), are truly remarkable. A Turkish hamam from the early 18th century. 1. If you keep digging, you can find remarkable things. I didn't know that we'd be able to locate the logbook of the ship that took the graffiti artists to Delos. This is a nice example where doing one more query gets your research to a whole new level. 2. Sometimes you have to go offline. I should say that I know where there's a book that will point me to the logbook. But it's not online. Yes, more and more stuff IS being digitized, but many archives don't have the resources to move everything into the digital realm. So sometimes... how have to visit the archives in real life. 3. Remember to follow parallel paths to get to what you seek. In the above example, the trick that got us to the logbook of the USS North Carolina was to do a search for Commodore John Rodgers, who we KNEW had to be onboard with M. C. Perry. That kind of parallel searching is incredibly useful (when you can do it). Sometimes the shortest path to your goal is to find someone (or something) that must also be closely related to what you're searching. I'll let you know what, if anything, I learn about the whereabouts of the logbook. SearchResearch Challenge (11/23/16): The Greek islands: birth and graffiti? ... and one of the things I'm thankful for was the chance to travel to such interesting places this year. It really was a great year of wandering-about. 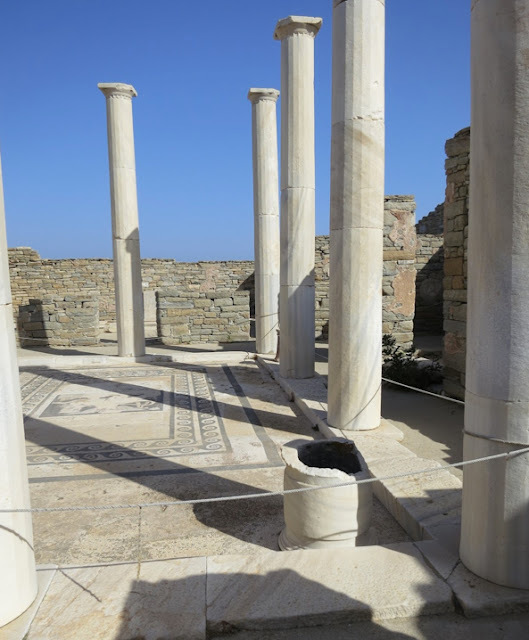 The Greek island of Delos is a remarkable place. 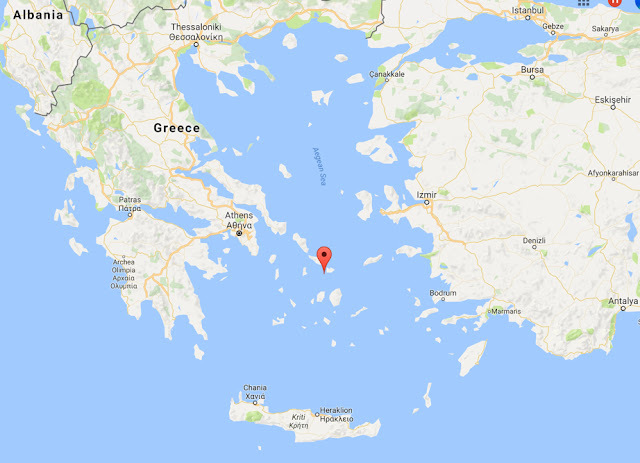 It's a smallish island in the Cyclades chain, more-or-less dead center in the circle of the Aegean Sea. As one of the most important mythological, historical and archaeological sites in Greece, it has archaeological excavations that are gigantic, as befits the birthplace of Apollo and Artemis. It was also the center of the Delian League and the Delian Festivals (with their every-4-year athletic competition). When I visited the island, it was on a perfect fall day--endless blue sky, deep blue Aegean sea. Approaching Delos on the ferry. You can see LOTS of temples and ancient buildings as you come near. It's really quite a place. As you can see in the above picture, nearly the entire island is one giant archaeological site. People have been coming this way for thousands of years, both for religious and commercial purposes. Central courtyard of a wealthy businessman. Note the circular cistern access in the corner of the courtyard. Beneath the courtyard mosaic is a large, rectangular cistern for collecting rainwater. Delos was a stopping off point for traders, priests, slavers, worshipers, and travelers of every kind. But the island was attacked in 88 BCE by the Persian troops of Mithridates VI, an enemy of Rome, who killed nearly all of the 20,000 Romans on the island. Another attack came from pirates in 69 BCE, which basically knocked Delos out of action as an active trading island. By the end of the 1st century BCE, trade routes had changed to bypass Delos. Around this time it became uninhabited and left as a place that the curious (and the occasional pirate) would visit. So when I visited earlier this year, I toured the island with a guide, marvelling at the ancient buildings, theatres, and temples. This walk on Delos brings me to our first Challenge for this week. The tour guide took us all around, and then pointed to this graffitied statue base saying that it used to hold a very tall statue of Apollo, one was carried away by pirates sometime in the 16th century, leaving behind only the base. But when I looked at the graffiti, I did a big double take. There was something so obvious and remarkable on that statue base that I couldn't believe she didn't say anything about this. Does it capture your eye as much as it did mine? 1. What's remarkable about this graffiti? Do you see what I see? Can you prove it? A bit later on that same trip we went to Santorini--another beautiful island not far from Delos. It's a razor-back ridge of a place, with lovely blue-roofed buildings and incredible views, with several smaller islands nearby in a rough circle. As you probably know, Santorini is a C-shaped island with a center that was blown apart by a large eruption as the center of the volcano blew upward, leaving a giant caldera. That mega-explosion happened long enough ago that no written records survive (except, perhaps, for the story of the plagues in Exodus which many believe are side-effects of the Santorini eruption). As always, be SURE to tell us how you found your answer. What resources did you check? How did you know to do that particular kind of query? We're curious about the answers, but also in your methods. Answer: What does *that* mean? ... although sometimes you'll hear people say dismissively "it's just words" or "it's all just semantics," they're missing the point. Words, and the specific meanings of words, really DO matter. One of the interesting phenomena during the last news cycle is that heard all kinds of terms and phrases that you might not have quite understood. That's partly because people whip up new terms as a way of creating catchphrases or generating memes that people can have in mind. But we're SearchResearchers--we tend to look things up. You do, don't you? What do each of these terms mean in the current political context? I used quotes here to make sure I didn't find anything that wasn't exactly this phrase. 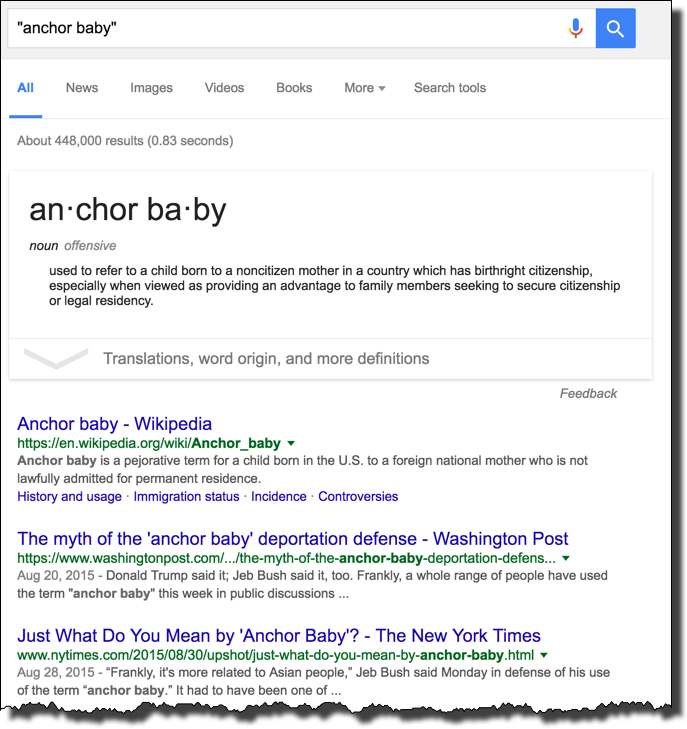 In the results, you see first a definition, and then enough current news items and discussion to be able to learn that an "anchor baby" is when a "noncitizen mother" travel to the US specifically to deliver that child an American land in order to give it "birthright citizenship." This one is fairly straightforward--just search for the phrase, and you'll quickly learn enough to understand both the idea AND the political context in which it's being used. This new term refers to the difficulties Hillary Clinton has had over her use of a private email server while she was Secretary of State. 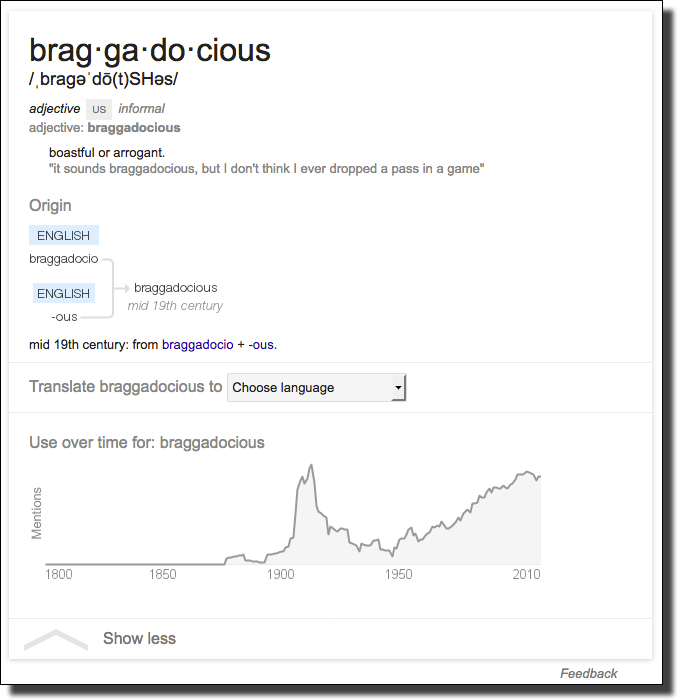 This tells us that the us of the word "braggadocious" predates this election, and was coined sometime in the late 1800s. tells you that it means "internet content, especially that of a sensational or provocative nature, whose main purpose is to attract attention and draw visitors to a particular web page." In the political context, it's sensationalistic or outrageous texts or images that will attract you from whatever it is you're trying to do. which will show you lots of examples of headlines and texts that serve to pull you in. You'll quickly learn that phrases like "What we found was shocking" or "Big companies hate him" or "What happened next was awful" or "5 examples of great clickbait" are all written expressly to get you to click. Notice that they are often incredibly vague, but kind of irresistible. But once you learn what clickbait is (and it's often used in political advertising), you'll know enough to resist it. We can use these same methods to understand what SEO is. Teaches us that SEO is "Search Engine Optimization is a method of strategies, techniques and tactics used to increase the number of visitors to a website by obtaining a high-ranking placement in the search results page of a search engine (SERP) -- including Google, Bing, Yahoo and other search engines..."
That is, it's what SEO people do to web sites to improve their ranking. Obviously, this is a good thing (if you a company... or a political candidate), and the trick for people who do SEO is to do it in a way that doesn't actually hurt the website's ranking. It's kind of an ongoing battle: the SEO people get paid to make their customer's website appear higher in the SERP ranking, while the search companies (Google and all the rest) work hard to minimize the influence of any manipulations the SEO people make. Google publishes clear guidelines (Webmaster guidelines) on what makes for a good website (in short, create content for people, not search engines). So now we have some methods to tell us what a "dog whistle" is in the current political environment. That query shows us a definition: "Dog-whistle politics is political messaging employing coded language that appears to mean one thing to the general population but has an additional, different or more specific resonance for a targeted subgroup." And the first hit is to a Wikipedia article about dog whistle politics. This is "coded language" that reaches one set of readers who understand it to mean something very different than the overt meaning. There is a reason you know Obama's middle name but not McCain or Romney's. It's because reminding everyone that Barack Obama has a scary foreign-sounding name, that ALSO sounds Islamic, which happens to be the same as that nasty dictator. This plays really well with a certain audience. It's a kind of "dog whistle" to that part of the population, casting doubt on his ability to be president. 1. Look it up! This is obvious, but I see people reading all the time, glossing over language that they don't understand. 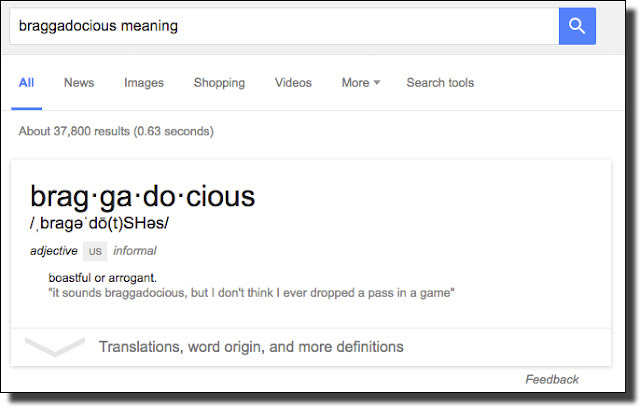 Keep asking yourself, "what DOES that word mean?" This is an important reading strategy. If, by the end of the article, you can't summarize it, or explain what each of the words and phrases mean, you've missed an opportunity to learn something. 2. Use DEFINE or MEANING to get short definitions. 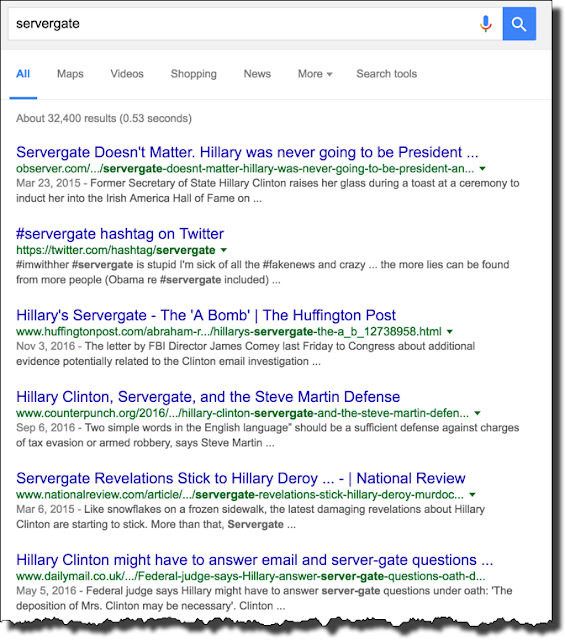 These are triggers for Google to give you a short summary or definition. 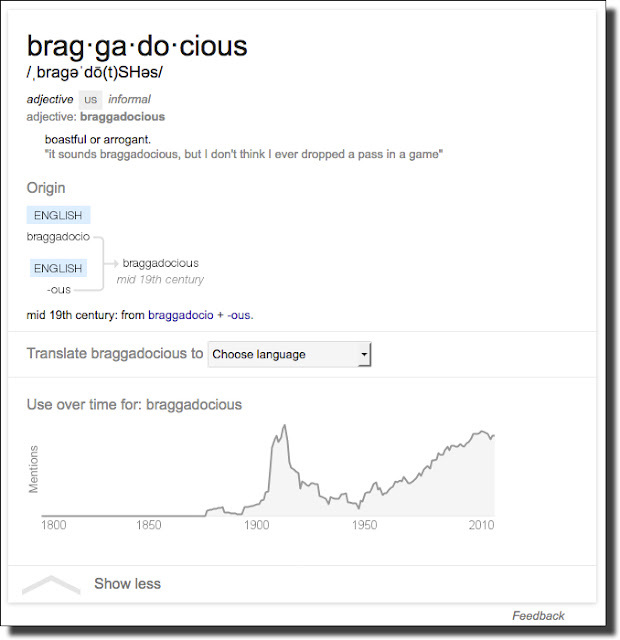 These work not just for individual words (like "braggadocious") but also for phrases such as "anchor baby" or "fourth estate." 3. Look for Examples. For many complicated ideas, sometimes the best way to understand is to get examples of the concept. 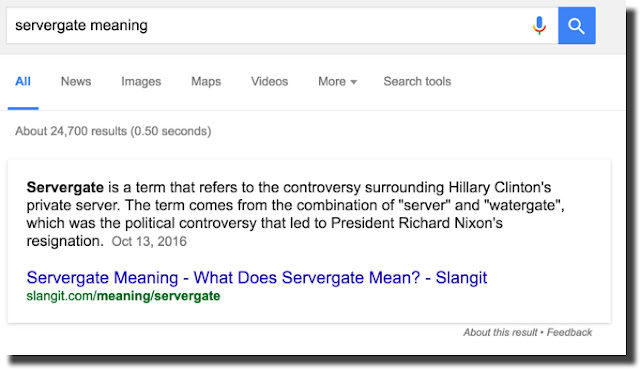 If you're still uncertain after looking up the definition, search for [ examples of ] -- that will often give you some nice examples of what you seek. This whole topic (of how to lookup terms and phrases) is a crucial part of giving students a tool with which they can understand almost anything. If they have this, then a world of new texts opens up to them. When I wrote above that I read books with my phone in hand, I'm completely serious. I was at my favorite coffee shop this past rainy weekend reading about the history of the Silk Road (Shadow of the Silk Road, highly recommended). In the space of one chapter, I had to look up 12 different things. Sometimes they were really obscure (the Kunlun mountain range, one of the largest in Asia), but sometimes I'd look up words that I sort-of know, just to check. For instance, I looked up "ochre" which I thought I knew, but when I looked it up I learned that it's an earthy pigment of ferric oxide and clay, varying from light yellow to brown or red, although typically a pale brownish yellow color. It changed my understanding of what I was reading. If I do this, I bet your students should be doing this as well. 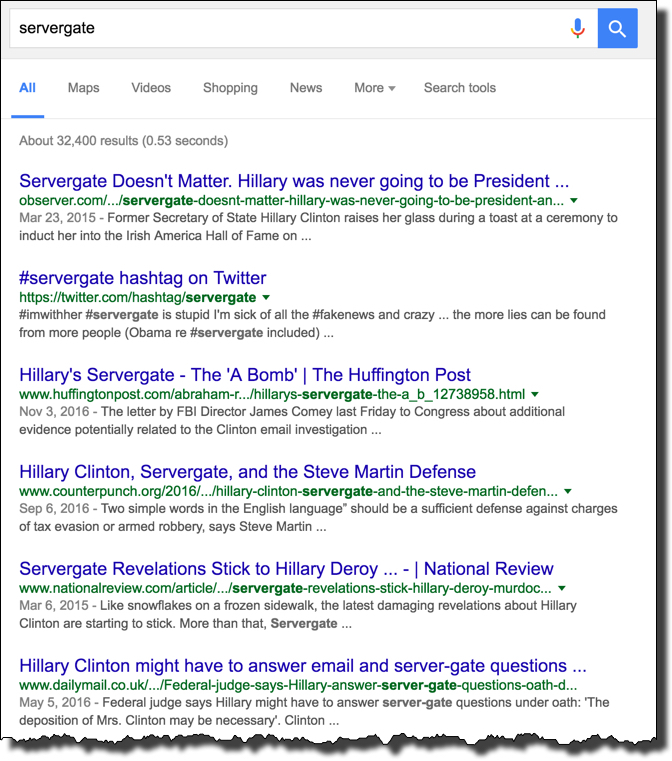 SearchResearch Challenge (11/16/16): What does *that* mean? ... from a long and difficult election season that was full of seemingly endless stream of articles about the candidates, their positions, where the culture is heading, and whether or not we should consider moving to Canada. One of the things that happens during a busy news cycle is that you'll hear (or read) terms and phrases that you might not quite understand. That's partly because people whip up new terms as a way of creating catchphrases, but also because the language of politics isn't something most of us deal with everyday, so some of these ideas are a bit rare. But you're a SearchResearcher! So I'm willing to bet you looked these up as part of your normal behavior. How many of these did you hear over the past few months? Did any other terms or phrases appear over the past couple of political months that you had to specifically look up? Be sure to tell us what you did to understand these terms and phrases. 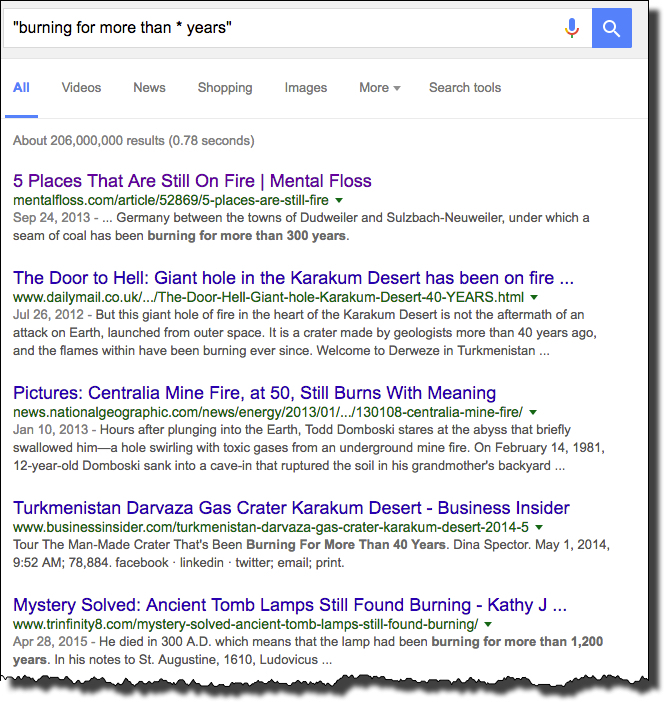 Sometimes SearchResearch Challenges are tough..
and found a couple of hits on the topic of "Places that are still on fire." (1) Brennender Berg ("burning mountain," in German), is an area in Germany where a seam of coal has been burning for more than 300 years (since at least 1688). Johann Wolfgang von Goethe (the famous German poet) visited the Brennender Berg in 1770 and commented on it in his journals. (3) Mount Wingen, Burning Mountain is 139 miles north of Sydney, Australia, and is part of the Burning Mountain Nature Reserve. Estimates are that this coal seam has been actively burning between 5,000 and 15,000 years. (4) Centralia, PA has another coal seam fire that was started by accident in 1962 when locals tried to burning some trash in a pit that was connected to the nearby coal fields. It's still burning (and the town is abandoned). (5) eMalahleni, South Africa is yet another coal seam fire since at least 1953. Coal mining has been a major industry in the Mpumalanga province (formerly East Transvaal) of South Africa (previously known under its Afrikaans name as "Witbank"), and as you'd expect, an accident in such a place leads to long-lasting fires. If there are 5 coal seam fires scattered around the world, this made me think there are probably more. But how could I find them?
" has been burning for more than years"
“The Door of Hell” While drilling in 1971 at Derweze, Turkmenistan, geologists discovered a large pocket of methane in a cave that collapsed as they drilled. Although nobody was killed, they decided to set it on fire to handle the outgassing problem, but obviously THAT didn't work out. The Door of Hell is around 69 meters across (roughly 1 football field in size), still on fire, and shows no signs of abating. There are lots of long-lasting fires like this: Jharia Coal Fields, Jharkand, India (since 1916); Baba Gurgur, Kirkuk, Iraq (approximately 2,000 years); Yanar Dag, Baku, Azerbaijan (since at least the 1950s) and many others. I honestly had no idea that such fires were so common around the world. 2. A related kind of surprising on-going process is the recent discovery of a natural atomic fission reactor! Apparently, there is at least one place in the world where fission has been taking place without the use of any technology. Where is this place, and how is such a thing even possible? (Don't you need complex reactor buildings, control rooms, and trained operators?) What's the story here? 3. Can you find any other related on-going natural disasters like this? To qualify, they should be processes that run for many years at a time (not just single eruptions or earthquakes). I found a couple of interesting places by accident during the "fill in the blank" search. The first was the “Gate to Hell” in Turkey, while it's not a site of active burning, it IS a place where poisonous gases come up from the earth with the ability to kill animals (and people) who linger too long. P/C Rolf Cosar, from Wikipedia entry on Erta Ale. 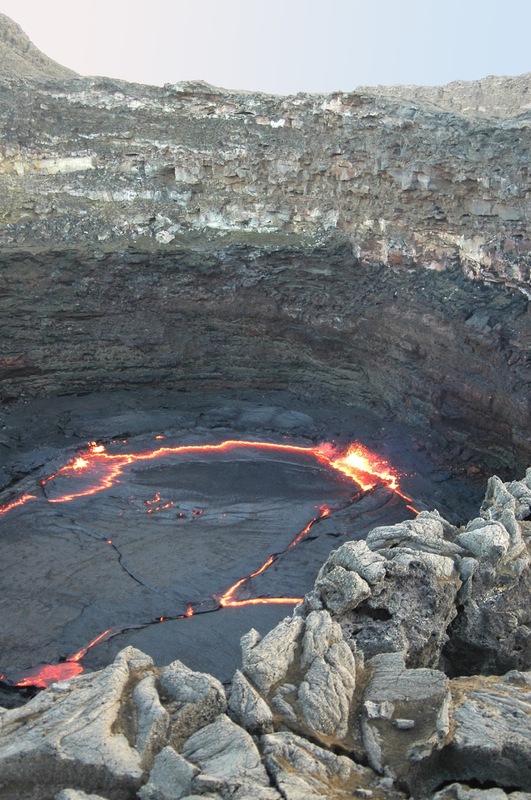 And, if you remember, we talked about the "erupting lakes" of Africa in an earlier blog post. Those lakes would definitely qualify as ongoing (or at least, recurring from year-to-year) natural disasters. This question was pretty open-ended, and it was interesting to see what other people looked for. As I searched, I realized that some common phrases here would be "annual disaster" or "recurring disaster" and similar. Doing those searches leads to all kinds of repeating disasters (flooding, hurricanes, monsoons, etc)--and then you can start to find annual disaster reports by think tanks (e.g., the Brookings Institute "Year of Recurring Disasters"). The thing about these kinds of disasters is that they're all localized: monsoons flood southeast Asia, hurricanes devastate the southeast United States, fires in Indonesia, volcanoes around the Pacific Rim, river floods along large flood plains. So once you find a recurring disaster (say, flooding along the Mississippi), you can start to check news reports from local sources to get a deeper insight into what's going on. can be used in many settings--but the principle is always the same. Find common phrases that are central to the concept you seek, and then find ways to turn them into patterns that can be filled in. also gives lots of useful results (including several about repeating floods and earthquakes). This is especially useful when you're investigating a topic area for the first time and trying to get a lay of the land. By letting the * match things that you don't know, you're effectively searching a broader area than you might have imagined. It's a slightly scary proposition--that there are diseases and plagues that recur, but this is definitely within the disaster scenario. And using the * fill-in-the-blank search pattern is one way to discover these kinds of events that you don't know about.